This is the best vegetable soup recipe on my whole block! Or maybe in this house? Seriously, it is good. It is the recipe that will stop you from feeling bad about all the indulgence of the holidays. Everybody talks about “weight loss” soup and I think that the concept of a soup that will fill you up without many calories is a good one. Here are the other soups that I am eating right now low carb chicken vegetable soup and my Mexican chicken soup recipe. The better (or best) recipe does more than help you lose weight - it makes you healthier! 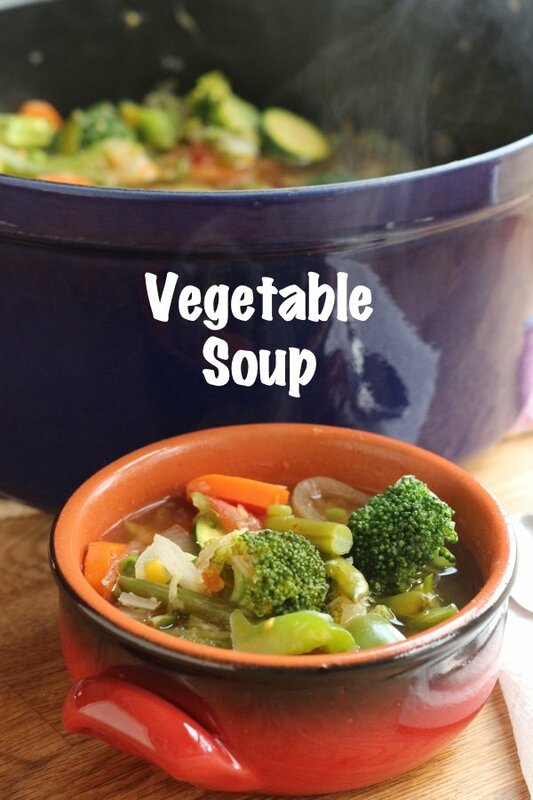 This vegetable soup recipe is like “Stone Soup”. You just keep adding ingredients until you get a wonderful, full pot of steaming yumminess. I used this product, Better than Bouillon, instead of bouillon cubes because I have heard that this concentrated stock is pretty good. You can use vegetable stock (or any stock you have) if you have it on hand. I found that Better than Bouillon was pretty tasty and I could control the amount of saltiness by not adding too much. Bouillon cubes are not as easy to regulate as this paste. Most cooks online said to use half the amount of Better than Bouillon than was called for on the packaging. You can use 1/2 teaspoon for 8 ounces of water. Have any of you used it? Please tell me what you think of it in the comment section. My fridge has a big container of this ready to eat for lunch so I can start the new year in the best way. It would be better in the summer with the freshest vegetables but it still tastes pretty good. 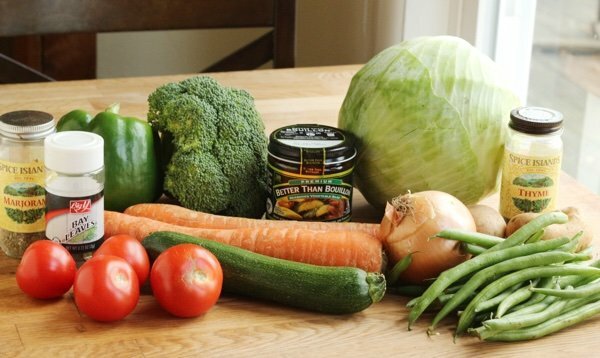 What is your best vegetable soup recipe? What have I left out? Slice onion in half and slice into rounds. Slice carrots Cut potato into small cubes and snap beans into 1-inch pieces. Shred cabbage and put onion, carrots, potato, and cabbage into 6 quart cooking pot. 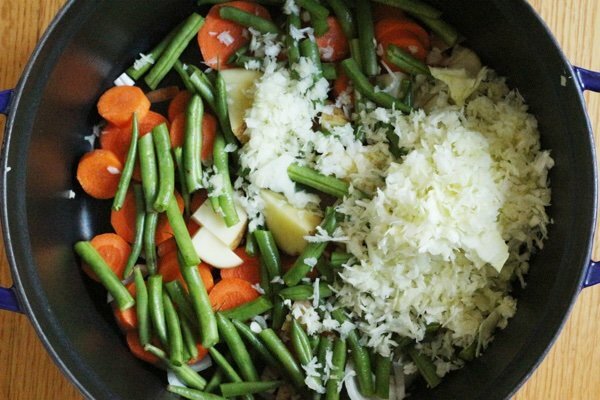 Add bouillon and water to cooking pot with vegetables. Bring to boil, reduce heat to medium low and simmer, uncovered, for 10 minutes. Meanwhile, slice broccoli stem into rounds; leave tops whole. Cut tomatoes into eighths. Stem green pepper, remove seeds, and chop. Slice zucchini into rounds. Put broccoli, tomatoes, green pepper, zucchini, corn and peas into a bowl. To the cooking pot, add vegetables in bowl, herbs, and stir. Bring to a simmer and adjust seasonings. Simmer, uncovered, about 10 minutes longer, until vegetables are crisp-tender. Enjoy! You mentioned that you don't have time to make stock. I know that you have an instant pot, though. That makes stock-making easy and fast. Once you try homemade stock, you'll never want to go back to cubes or paste. There's no salt or chemical taste. I keep bones from chickens (when I roast a whole one) and the leafy ends of celery, carrot ends and peels -washed, of course- and onion ends in a freezer bag until I have enough to fill the insert of the instant pot. Add water to the pressure cook line, a couple bay leaves and peppercorns and whatever seasonings you like, then pressure cook for 2 hours. When it's done, strain it with a mesh strainer into another big pot and refrigerate. When it's cold, it will become jelly, and the fat will all float to the top and become a solid. Skim it off and you have delicious liquid gold. I freeze mine in 2 or 4 cup amounts in freezer bags and use as needed in any soup recipe. You can do the same with any kind of bones, or with just any clean vegetable scraps. You don't even need to defrost the ingredients that you've saved up, just throw them in the instant pot. I have always made stock on the stove top, but it's a days long process that requires constant supervision. It is so much faster in the instant pot, and doesn't need babysitting. And with the keep warm feature, you could put the stuff in before bed, (or work) and let it do it's thing, then strain and refrigerate when you get home. One last thing... If you save all of the bones from the Turkey breasts that you cook for your family, then make stock from them, you will be able to make the absolute best Thanksgiving Turkey gravy you have ever had! I agree with bittytux & ACE! I even made bone broth in the crock pot last week because I was using the other pot for something else. I freeze it in 1 cup containers, then remove them from the containers & put the frozen broth into freezer bags. They seem to take up less space that way. I've been using Better Than Bouillon for years! I think it's a little salty, too, so I try to be careful. Everyone always asks me why my turkey gravy is always so good--a little bit of chicken Better Than Bouillon is my secret! 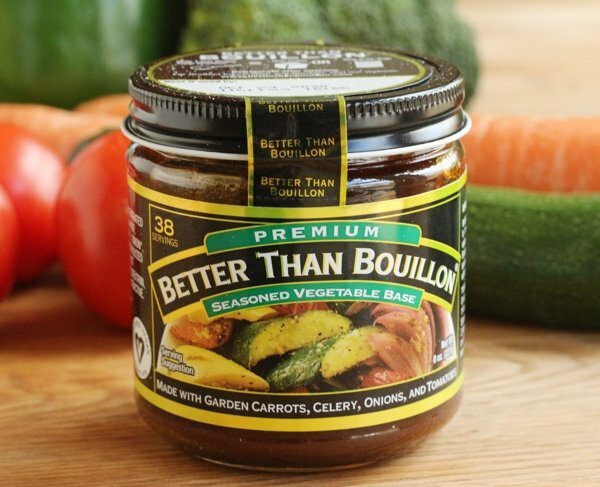 I’ve been using Better than Bouillon but haven’t tried the vegetable base. It’s a little pricey for a small jar in a regular grocery store but I’ve found it at Costco for a lot less. It seems to keep for a long time if the jar is well sealed. Have been using Better than Bouillion for years in soups. I buy the low sodium version at Costco. Beef, chicken and Vegetable, all good. Thanks for the soup recipes! Love your blog! I’ve been using Better Than Bouillon for years also. I use the No Chicken (vegan), Beefless (vegan) and the Vegetable and their newest -Garlic. I like them all and think they make the best stock short of homemade. The soup recipe looks great. I think I’ll throw in some chickpeas or beans for a bit more protein and a satisfying dinner. BTB ''no chicken'' chicken is a favorite of mine for many years now. The quick broth with a grated carrot and pastina during flu season has been a life-savor. I use it in almost every homemade soup. Sometimes just a cup of broth with a sandwich is just right. 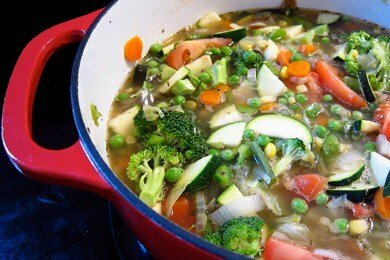 Your veg soup looks delicious, I do a similar one with barley and mushrooms. I use BtB often, it's a nice flavor boost and if you use it sparingly you can control the sodium well. Even when I'm making my own stock (no IP here, just do it on the stove) I add a dab of BtB to it to boost the flavor. Why not, it's concentrated 'good stuff'. Also-- this type of veg soup is fabulous and because it's all vegetables, you can add a little grated parmesan to your individual bowl to enhance the flavor even more without adding a ton of calories and very little fat. I use Better Than Bouillon roasted chicken paste all the time. There in NO MSG. It is natural and delicious. So much flavor, I use it when I make my enchilada sauce from scratch. Homemade broth takes a lot of time and I think BTB is better. It is condensed from long cooking times. They have pork, vegetarian, seafood, mushroom and lot of other bouillon tastes. BTW, peas, beans and green beans have a lot of carbs for those of you watching your carb intake. Wow, I made this using the collards in the garden and in the slow cooker. Added cooked beans (garbanzos on hand) for some protein. Tasty and thanks! I would like to ask about paragraph three I think...it says to stem green pepper. I’m not a terrible good cook. I don’t know what that means. I’m going to make it because I think it fits into the nutrisystem plan for the most part. I am also wondering if you could make this with your instant pot. (Just got one) I am definitely going to make broth in it! Thanks for the information!!! Every ounce of it helps me! Henny, It just means take the stem out. Good luck! Hope your soup turns out well. I had never heard of Better Than Bullion, btw. @Henry - Slice the pepper in half and pull out the stem and all the seeds. I usually rinse the pepper under cold running water to get all the seeds off of it. Great question! Thanks for the inspiration for a post on stock! Love the feedback and suggestions. Have used BtB lots. I buy it at Costco. In thinking of switching to homemade and then freezing. I make three gallons of veggie soup at a time. I buy at least one bag each of about any vegetable at supermarket - edamame, lima beans, green beans, edamame, broccoli, peas, brussel sprouts, diced tomatoes, beans etc. Chop up whatever I have in refrigerator fresh - carrots, celery, red peppers, turnips, rutebagas, potatoes, etc. I don't use leafy greens. They might get slimy and I those other ways. I almost always have a quart defrosting and a quart ready to eat in refrigerator. Rest in freezer. Easy, good, healthy. This soups sounds like a great quick veggie soup, that I would love. I use Better Than Bouillon too, and love it. Although I do make my own stock and buy Simply Nature organic stock from Aldi's that is really great! MY QUESTION. You mention that this is one Free Style point - is that the the Smart Points, and is it because the 5.9 g of sugar come from the veggies and no added sugar?